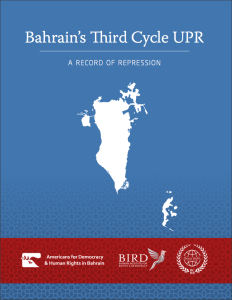 Americans for Democracy & Human Rights in Bahrain (ADHRB), in conjunction with the Bahrain Center for Human Rights (BCHR) and the Bahrain Institute for Rights and Democracy (BIRD), is pleased to announce our new report, Bahrain’s Third Cycle UPR: A Record of Repression. See a summary of the assessment below, and click here for the full report. 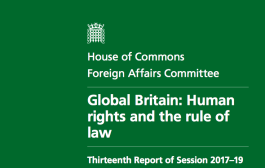 Just over a year after government forces violently suppressed the country’s mass pro-democracy protests in 2011, Bahrain entered its second four-year cycle of the Universal Periodic Review of Human Rights (UPR). 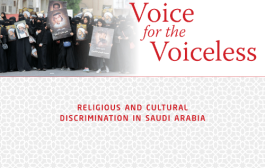 On 6 July 2012, member and observer states of the United Nations (UN) Human Rights Council (HRC) submitted 176 recommendations to the Bahraini government, addressing a wide range of issues from criminal justice reform to women’s rights. That October, the government partially or fully accepted 158 of these recommendations, pledging to take the requisite steps to bring the country’s practices in line with international human rights standards. 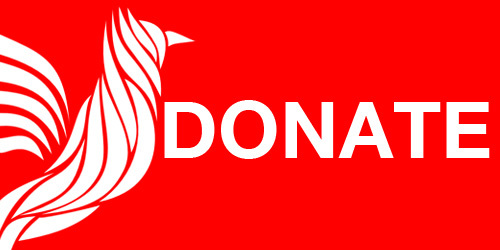 Four years later, at the end of Bahrain’s second cycle, Americans for Democracy & Human Rights in Bahrain (ADHRB) is forced to confirm its 2014 midterm assessment: the government’s second chance has become yet another missed opportunity. 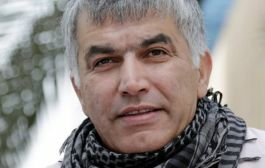 Since 2012 – and since the 2011 pro-democracy movement, more broadly – the Bahraini government has intensified its campaign against civil society and peaceful political opposition, imposing increasingly draconian restrictions on basic freedoms that have stifled progress across the spectrum of human rights. 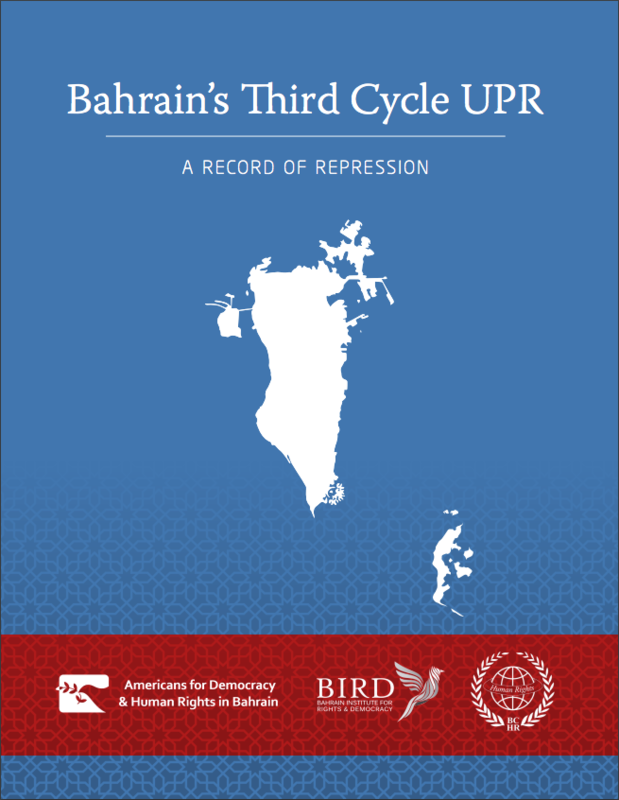 ADHRB, the Bahrain Center for Human Rights (BCHR), and the Bahrain Institute for Rights and Democracy (BIRD) have assessed both the Bahraini government’s technical implementation of its second-cycle UPR recommendations as well as its larger efforts to resolve the country’s major political and human rights challenges. We find that the Bahraini government has failed to fully implement any of its 176 second-cycle UPR recommendations. Of the 158 recommendations accepted by the government, only two have seen any significant progress toward implementation. 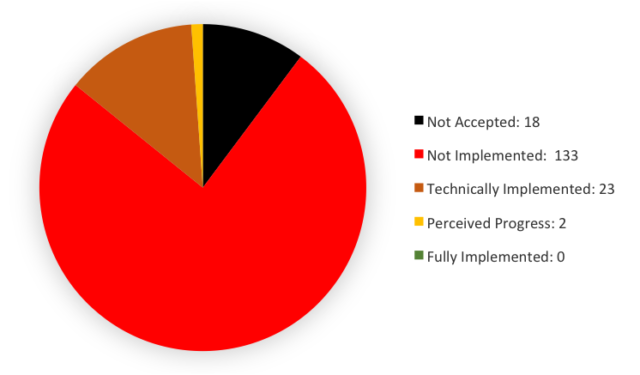 ADHRB, BCHR, and BIRD have not perceived any substantive progress for 133 recommendations and assess that 23 others have been merely technically implemented with little to no substantive impact. At the end of its second UPR cycle, the Government of Bahrain has proven either unable or unwilling to implement almost any recommendations, including those to reform its criminal justice system, curb the use of torture, or institute sufficient protections for fundamental human rights like free expression, assembly, association, and belief. Rather, Bahraini authorities continue to arbitrarily arrest, disappear, torture, and imprison individuals for exercising these rights. Since 2012, the government has significantly expanded its penal code, counterterror legislation, and cybercrime law to broadly restrict civil society and effectively criminalize all forms of dissent. 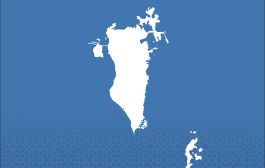 The government has additionally taken steps to harass, dissolve, and constrain most of Bahrain’s civil, political, and religious organizations. Notably, some important issue areas had seen limited improvement at the halfway point of Bahrain’s second UPR cycle, such as women’s rights and gender equality. Yet today, the government has significantly regressed even here, targeting women human rights defenders for reprisal and issuing problematic new policies such as a male guardianship system for female religious pilgrims. For these reasons we have downgraded the ratings of several recommendations since ADHRB’s 2014 midterm assessment, resulting in a lower final evaluation. Ultimately, the poor implementation status of Bahrain’s second-cycle UPR recommendations underscores a disturbing backward trend in the overall human rights situation. ADHRB, BCHR, and BIRD therefore call on the international community to not only hold the Bahraini government accountable for this complete failure to fulfill its second-cycle UPR obligations, but to also issue an even more thorough, pointed set of recommendations for the upcoming third cycle. We additionally urge the international community to take all possible measures to ensure the Government of Bahrain responsibly and transparently commits to a path of true reform as laid out by the UPR process for the next four years.